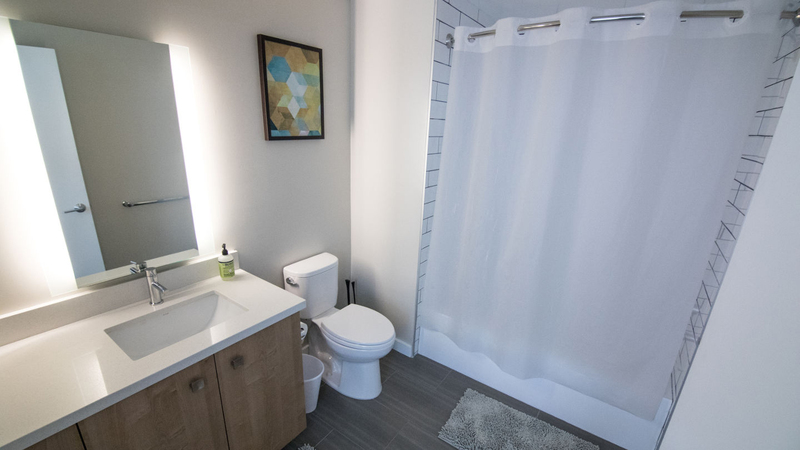 $1,375/month single rooms available in spacious luxury apartments at LSeven (West SoMa). Building amenities: 24/7 gym, front desk concierge, secured access, resident lounges, game room, storage room, etc. Apartment amenities: In-unit washer/dryer, stainless steel appliances, central A/C & heater. HomeShare offers housemate matching services at no additional cost and affordable shared rooms in brand-new, luxury apartments, perfect for those looking for affordability, convenience, and a nice place. 12-month lease, no pets allowed. If you want to smell marijuana 24 hours inside of your unit, here is a place. I reported this several times to leasing office, but they were not willing to help it even though this apartment has no smoking policy. The smell is coming from the fan which is operated 24 hours. Moved in July 2017. Overall: extremely expensive rent, no security, high-crime area, poorly insulated apartments, cars/bikes often vandalized, stolen packages, careless tenants. Other reviews seem to agree on this too. Let's start with the pros since it's a very small list: the building is new, so it is mostly clean. 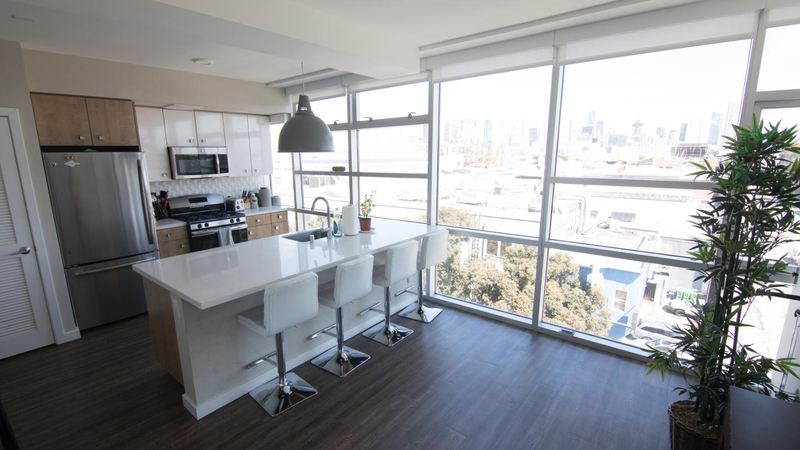 The floor plans are well arranged and depending on your budget, you can have enough space for two people; staff is friendly, but that stops here (if you have an issue, they raise their hand and show you the lease), and cool view of San Francisco from the rootfop. Poor security for a high crime area: the entire premise has very limited security. Bikes have been vandalized (saw a melted Kryptonite u-lock). Packages are consistently stolen. I've also seen cars being vandalized directly on the premise (including the garage). There are no functional cameras, so whatever happens, you can't even go to the cops. Apartment is not well insulated from the hallway and the outside. If it's cold, the apartment gets immediately cold. And if you don't have sunlight (which is our case), it tends to be freezing. The heaters are dysfunctional, it takes them hours to warm up the room. Windows aren't soundproof, if someone decides to scream outside, you can hear them just fine. Disorganized. Unprofessional. Once they get you in, forget about anyone being very helpful (or actually receiving packages you’re expecting. You might be lucky enough to find it in one of the heaps of packages dumped on the floor of the mailroom before it gets stolen. Let’s just say that like most of what they sell you about this property, their marketed “shop and ship simply” service is a sham. 4th and King. Great location next to caltrain, the ball park, and safeway. Two minutes from 280, perfect for peninsula commuters. I love living in this neighborhood. It's clean, quiet and has beautiful views from the top of the hill. Walking home feels like an accomplishment. Downside is there are few restaurants and grocery stores nearby. Loved living a short distance from the water. Perfect location for Fort Mason's sunday farmer's market, the bar scene on both Polk and in the Marina, and best of all, Loving Cup, the best frozen yogurt in SF. Great, chill neighborhood with good restaurants. Easy walk down the hills to both North Beach and the Financial District. Definitely recommend! Ashbury Heights is a nice, quiet neighborhood in a convenient location. It's close enough to walk to Cole Valley, the Castro, and the Haight, but it's far enough removed to feel like you're not in the middle of everything. It is on top of a big hill though, so be ready to get some exercise if you're walking a lot in the neighborhood. I miss living here. Amazing food, coffee, and bars within walking distance. Also close to a Walgreens. I loved living here! The JCC is a great place to work out and Ella's is right around the corner. It's also definitely walkable to Fillmore and all of the restaurants there. The downside is that it is close to Lower Pac Heights where things can get a little bit dicey. I love the Tenderloin Heights area, or so I've called it. You're just out of the Tenderloin craziness, but it's so close if you want to hit a dive bar or some great ethnic food. It's a short walk to BART, but you're out of the tourist zone of Union Square. And you don't have to walk all the way up to Nob Hill. My buddy lives in North Beach and I have stayed with him many times. It is a great diverse town that has a great China Town as well as my favorite Little Italy I have ever been too. Great food, great shops, and no need for a car because the transportation is cheap and fun. My buddy loves it here and it is a great place to land. Didn't fall in love with this apartment? You'll find the right one with our apartment guide in San Francisco.